While walking on the bluff near my home, I ran across this beautiful creature stretched out across the path. Scared me to death! Nearly had a heart attack! At first I wondered how I would get by him and started tossing small pebbles nearby to get him to move on. Very slowly he began to move away from the path. Then I realized how beautiful and he was and began snapping pictures. He (or she?) was such a lovely shade of yellow with brown and reddish blotches. 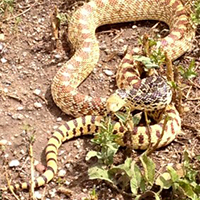 One of the largest and most often seen snakes in Colorado, this snake is not a threat to humans. They are non venomous but can strike if threatened. Sometimes they may vibrate their tail when threatened, which may sound like a rattlesnake, but it’s only for self-protection. Adult bullsnakes average about 4 to 6 feet in total length, and I have to admit, I thought this one surely must be at least 10 feet. They help us control the rodent population and feed mostly on mice, rats, pocket gophers, ground squirrels, and rabbits. In this picture, I believe he was aggressively posturing, seeing me as a threat. Enjoy these additional Colorado snake pictures.